Congratulations on your upcoming third wedding anniversary. The traditional third anniversary gift is leather, but Chicago Public Library also has some suggestion of modern gifts of glass and crystal. I’d say leather is not particularly outdated, but it’s nice to have some other options to choose from. Here are some great ideas for your third year anniversary gifts for her. What a gorgeous necklace for a gorgeous lady. Made in France. Hand-faceted turquoise bead necklace on cast brass with gold enamel. Give her this three-string necklace to commemorate your third year anniversary. Feel like sweeping her off her feet big time sparing no expense? Here’s your chance with these these statement-making, iceberg-inspired earrings feature 17.79 carat rough diamonds accented with 10.02 carat micro pavé diamond accents set in 18k white gold. Leather and brass add edginess to this stunning necklace. Inspired by water bamboo, this piece of Nagicia jewelry is handcrafted by Balinese artisans. Show ’em who’s boss in this silk-lined leather bra that is an effortless mix of feminine and edgy. Bring a little personal flair to her wardrobe with this leather bracelet complete with your custom-engraved message on the heart charm. 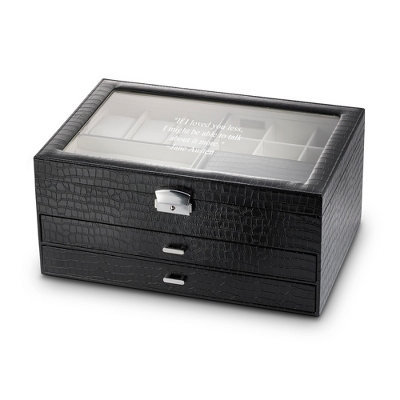 A perfect leather gift for the jet setter lady. This large black leather tote bag features handwoven kilim side panels from Morocco with Cobra Society signature hardware and tassel. Perhaps add an amazing weekend trip? Rich in detail and with a dash of edge, this vase is stunning perched alone or blooming with a bouquet. But of course you are going to fill it with flowers when presenting to your special lady. 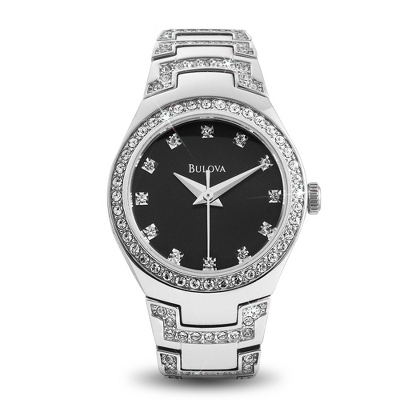 From the Bulova Crystal Collection, this gorgeous stainless steel watch, with Swarovski elements® crystals, has a classic look that will be a show-off on her wrist–and a showpiece just for her eyes when she looks at what you’ve engraved on the back of the watch face. 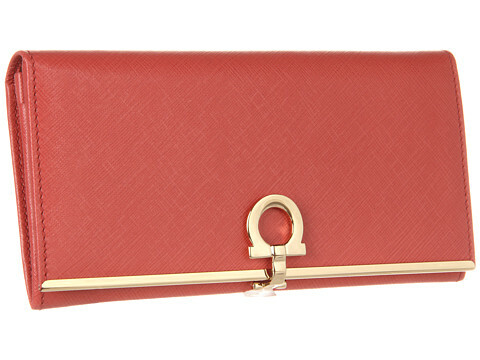 This gorgeous Salvatore Ferragamo wallet is a piece of art in leather that she can use everyday. Does your sweetheart have a funky sense of style? 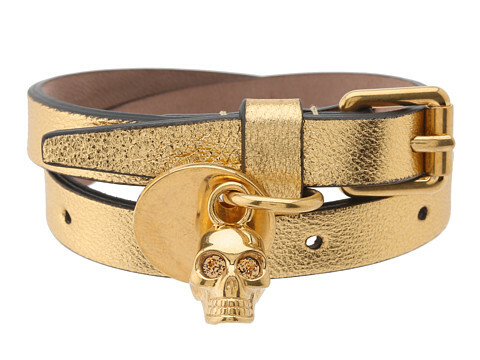 Then give her this Double Wrap Bracelet form Alexander McQueen™ made of leather with its signature skull pendant is adorned with Swarovski® crystals. If you enjoy having adventures with your lady, traveling around the world, then what other gift is better than this wonderful carry-on luggage is made of nappa leather? 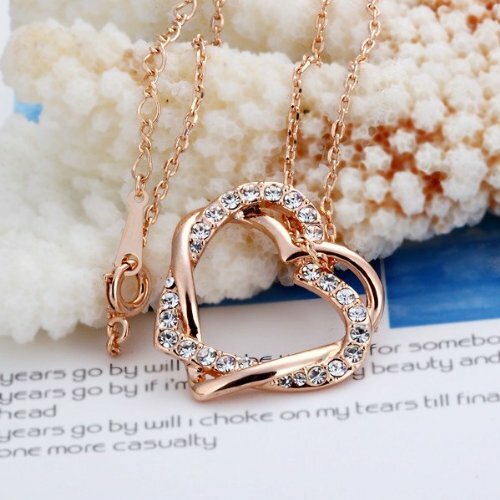 This lovely intertwined hearts 18k Rose Gold Plated Swarovski Elements Necklace symbolizes forever Love. Go ahead and wear it with the hearts dangling or straight. Comments? What do you think about these third year anniversary gifts? Tell us your experience? Do share!